Plan and perform your tests using the web portal, using a browser on the device or on another computer. When you use the web portal for testing, the test runner doesn’t interact with the software that you’re testing; it simply acts as a checklist of the test steps. Therefore, you don’t have to run it on the device that you’re testing. This option requires no special preparation on the device, other than installing the software. Couple the device to your computer, and run the tests using Microsoft Test Manager. This option allows you to capture screenshots and collect diagnostic data from the device. 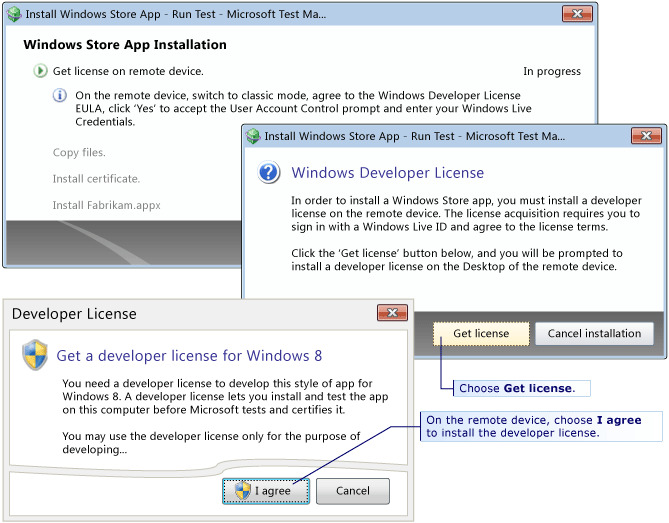 You can perform manual tests of Windows Store apps on any type of Windows 8 remote device. If possible, use the same user credentials or the same Microsoft Live ID on the Windows 8 device and on the computer that is running Microsoft Test Manager. If the user is different, the machine that you are running Microsoft Test Manager from will display a credentials dialog box when you try to connect. The Microsoft Test Tools Adapter Configuration Tool will appear on the device as a new tile. 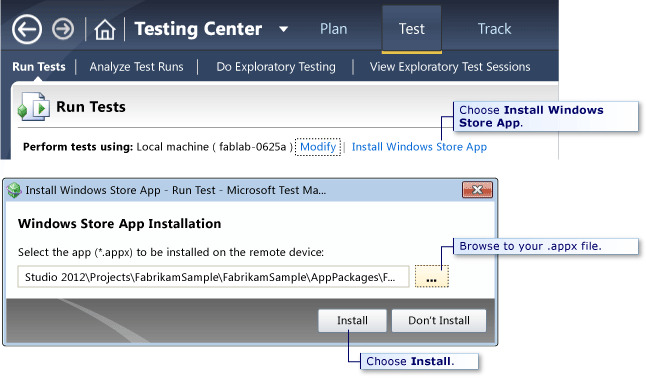 Choose the Microsoft Test Tools Adapter Configuration Tool tile in Windows 8. Choose Start Service in the configuration dialog box for Microsoft Test Tools Adapter to configure the Microsoft Test Tools Adapter. On the machine that you are testing from, open Microsoft Test Manager. Create some test cases if you haven’t already done so. 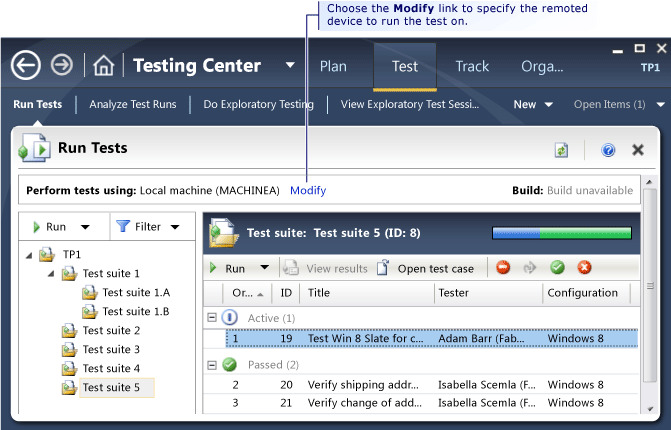 On the Run Tests page, choose the Modify link next to Perform tests using: to specify the remote Windows 8 device. Choose the Remote device option and enter the name of the device that you want to test. By default, port 6905 is used by Microsoft Test Manager to communicate with remote devices. If you want to use a different port, enter the remote device as deviceName**:**port. For example, mySlateDevice1:8001. You must also change the port on the remote device by opening the service configuration file mttaservice.exe.config in the Visual Studio installation folder. Choose the Test link to verify that Microsoft Test Manager can communicate with the remote device. Choose Install Windows Store App, and then enter the path and name of the .appx file for the Windows Store app that you want to install. Perform the steps in the test on the remote device. As you complete each step of the test, mark it passed or failed on the host computer. Action record/playback Windows Web apps – Yes. Windows desktop and store apps – No. Verify that the share location where the .appx file and certificates are stored is properly secured.